Celebrations are an integral part of Indian culture and every celebration is marked by a grand feast. Rice is not only a staple diet in our country of varied flavours but occupies a special place in the menu in varied forms. With production every year, one can well reckon, the love we have for this grain. So, as I write this particular piece, I write with all my heart being a loyal rice eater and can devour plateful accompanied by lots of guilt. However, with the world turning health conscious and indulging in great ways to keep themselves on the fitness track, the popularity of white rice has certainly dwindled. Eating white rice is generally accompanied with lethargy, heaviness and it does not keep satiated for a long, so even after a big rice meal, you begin feeling hungry in no time. There is a huge loss of all important nutrition and minerals during the processing of white rice and consuming it in huge quantities is related to chronic diseases like diabetes and obesity. The most celebrated spice since time immemorial, Turmeric, sprinkles its magic on rice too. This revered spice for centuries is basking in the glory of its goodness, it embraces rice with all its wholesomeness and abundant nutrition to keep its healthy quotient intact. This super spice, lends its innumerable anti-inflammatory, anti-oxidant properties, infinite therapeutic properties, brilliant colour and earthy flavour. Science has confirmed that turmeric, the golden goddess, is as good as 14 drugs. The turmeric treated, Bagdara Rice, stands to enjoy much longer shelf life, with turmeric being a natural and effective anti-fungal, an antibacterial agent, which shields the rice from various bugs and lends it a pleasant lemon hue. The turmeric rice is easy to digest by the body unlike the heaviness caused by white rice, Bagdara Rice turns rice eating into a healthy option. The turmeric coated rice also controls the spike in blood sugar level by regulating the breakdown of carbohydrates. Bagdara Rice is an anti-flatulent, easy on the stomach and is considered an effective fat cutter. 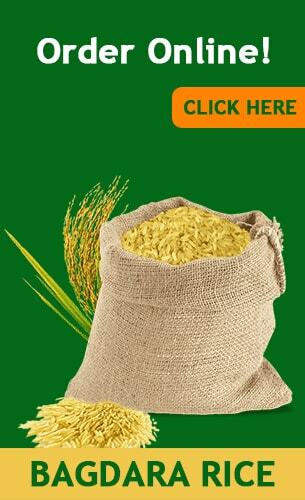 BAGDARA RICE, is also a safe option, for the health of your heart. While the goodness of Bagdara Rice tantalizes your taste buds, The turmeric in the rice ensures to preserve your overall health through its power packed minerals and nutrients. Bagdara Rice is a healthy tasty option, from the lap of nature. So go indulge in your favourite rajma-rice, guilt-free by opting for this, oh so healthy Bagdara Rice. My mother in law s a diabetic patient whose sugar levels are always on the higher side just for the simple fact that she cant give up eating food especially rice. She tried to control a lot but used to always end up sad if not eaten rice for at least one of her meals. The doctor then advised that we try Bagdara rice. Since it is coated with turmeric it apparently controls the fluctuations in the blood sugar levels. Apart from that, the colour and the taste is also quite good.